The New Era promotes, if not prescribes, social events. We must be included in a numerical account. “On your own, brother ?” to quote George Orwell in his famous novel 1984 would be the relevant inquiry of the day. Our experiences must be groupal. But, to approach a new town, a new world, to go beyond the cultural shock, at times, solitude may be, if not instrumental, at least appropriate. To become available, “context sensitive” — to metaphorically use a terminology inherrited from the formal linguistics —, to the environment, to the situation. To be perceptive, not already saturated by the influx of signals coming from the group, from the life of the social cell. That’s how I enjoy to “appreciate” a new place, to listen to it, to be reactive, immersed in it, without being the solitary wolf (let’s be clear about this point). When you discover Kyiv, it may really be disconcerting. In a sense, two separated cities are linked or united by a forest thriving on the wide islands amid the different streams of the Dnipro river. Until 1923, Kiev (Russian spelling of the name) was only represented by the city on the right bank, the left one being known as the village of Darnitsya. Soviet authorities, newly arrived the previous year, decided otherwise and this decision has not, since then, been contested or overturned. Anyway, despite this declared unity, something remains in the conscience and landmarks of the Kyivians : people living on the right bank of the river (where you can find among others : the Place of The Independance, the Parliament, the Presidential Palace, Khreshchatyk Bld, the Olympic Stadium, the Central Railway Station, the Lavra of the Caves, St Sophie’s, St Andrew’s, St Volodymyr’s and St Mikhail’s Cathedrals, as well as Taras Shevchenko’s and Mohyla Universities…) may never come across the Dnipro to visit the left bank. You will say that they would not have any good reason to attract them until that remote left bank. But, the gap is deeper than that. Some people from the right bank consider that they will never go to the left bank throughout their life, even if nothing prevents them from doing so. An imaginary boarderline. Ok, let’s take it for granted. Once you start to get used with the distances covered by the network of public transportation (metro, bus, trains), you consider that there is some relevant meaning in this odd fact that I just described. But, that’s hard to feel the city of Kyiv without diving in the forests of the islands on the Dnipro, as paradoxical it might appear. Talented photographers have published many marvelous shots of these sites, under the burning heat of late June as well as caught by a thick cover of ice and snow in January. The Pedestrian Bridge which you reach by walk when you arrive from the metro station Poshtova Ploshcha (Post Office Square) in the Podil district intrigued me while I discovered it in the touring guide “Touring Kyiv”. To what led this huge iron and concrete footbridge ? During my first travel to Kyiv in July 2006, I did a first very short visit to the first beach beyond it, late in the afternoon when the burning sun was going north to set in flamboyant colours and I felt a very strange atmosphere among the people laying on the sand or swimming in the glowing light, atmosphere that I was not yet able to translate. That’s why, in June and July 2009, I decided to go further in my impressions and to try to capture it, to get it all. I went there several times, walking through the woods, visiting the resort Водна Станція, the Water Station, searching I don’t know what exactly in the heat of the dusty tracks. And eventually that was that. The oceanside. Yes, I was on the oceanside of Kyiv. Not surprising that the great reservoir lake on the Dnipro River northwards of Kyiv is called the Kyivian Sea or Sea of Kyiv. The sand, the smell of the pine trees in the hot air, the excitement of inhabitants on the beach and in the “resort”, the shorts, the games, the laughters, the shouts, the screams, the retailers of drink and ice-creams. Just dream that you are on a beach in France or Spain on the Atlantic Ocean and that’s the same. You are there. The dream makes it. The dream embellishes life and gives it a price. 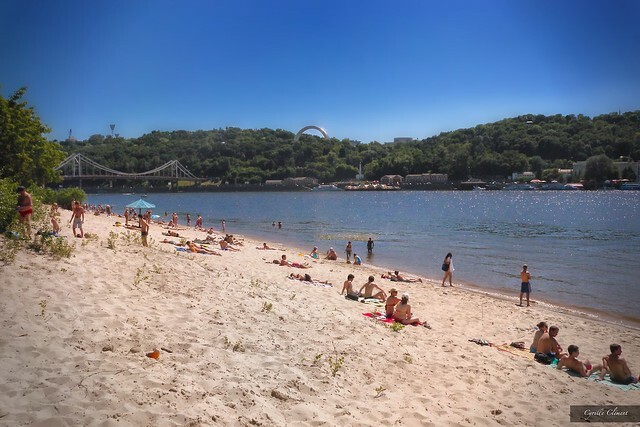 This is where a statistical study, published in the French review of Foreign Affairs “Politique Étrangère”, about the behaviour of Ukrainians during holidays came to make sense to me : the conclusion of this study stated that a majority of the population stays at home during Summertime, without travelling, for financial considerations. But people must not be diminished because reality is not providing all the matter of fact goods. Imagination completes what is not granted. In my attempt to experience a subjective dimension of the Ukrainian life, I first had a lunch in a restaurant on the beach, a few meters away from the Pedestrian Bridge. I enjoyed very fine Ukrainian dishes, like varenniky, under the pine trees, the sun beams and the hot wind. And I thank the personnel of this restaurant who kindly granted me the authorisation to take some pictures. Two days before leaving Kyiv, I went a second time to the restaurant. The personnel recognised me and I was the first customer this precise very hot Saturday midday of mid July. I took a wooden table amid the trees and the blond waitress turned on the stereo on the bar the give some animation. The radio station was Люкс ФМ, in other words, Lux FM, a 24/7 Ukrainian and Russian pop music station. But suddenly, immediately I must say, the first notes of the first song I heard were the ones of a song I had not heard since years before. A French pop song from the 1980’s. I felt a violent emotion. The song was “Voyage voyage” from the group Desireless. I was stunned, silenced. Suddenly, the text had a profound meaning to me and I listened to it carefully for the first time. I told the girl that I did not ear this song since twenty years and she watched me, a mysterious smile on the lips, satisfied of the emotional impact she had on me, as a sorceress she was, though she did not understand a single word in French. “It’s like that here”. She behaved exactly as if she had the power to program the song on this radio station right at that moment. The hazard was miraculous. And there, I thought to the magical literature left by Nikolai Gogol like Viy. The whole lunch happened in this extraordinary atmosphere. I watched them, these young men and women, dressed like beach boys, with their sharp body language, their absolute expressions, their intense gazes. They were reactive, intuitive, definitive. A few years later, this Summer restaurant was demolished after a decision of the city authorities.